For the next few weeks Colleen’s Tuesday Poetry Challenge is on hiatus as Colleen sells up and moves home which is very exciting.. She has asked that her regular participants continue with their weekly poem and I shall do just that. It is poet’s choice, so this week I have decided to combine the prose and verse of a Haibun. I walk through circles created by the drops of rain in the puddle of moonlit water. Like the cyclical movement of my life since birth, some of the rounded shapes are clearly defined. Others are blurred as they radiate outwards. Always seeking something. Where they merge with larger circles they are absorbed and become part of a greater entity. Some just make a small ripple that is barely noticed. I disturb the water with my feet, briefly distorting the outlines. But, within seconds, they resume their radiating formations as if I was never there. Posted on November 11, 2018 by Smorgasbord - Variety is the Spice of Life. This time of year, I like to re-post the series The War Poets. Just some of the men and women who served on the front line on all sides of the conflict who fought, died or returned scarred by their experiences. If you scroll down the home page you will find them each day. They went out at 4.a.m each morning my time, which is the coldest before the dawn, and as they would have woken in the trenches to prepare for another day of horror, bravery and sacrifice. There is no way in the world that I would possibly compare my poetry to those extraordinary men and women who wrote their poetry following their own harrowing experiences. But I did want to add to the series with my own tribute to someone who lived and died during the First World War, and I this poem following my first visit to my grandfather’s grave in Northern France in 1998. My mother was thirteen months old when her father was killed on November 2nd 1918. 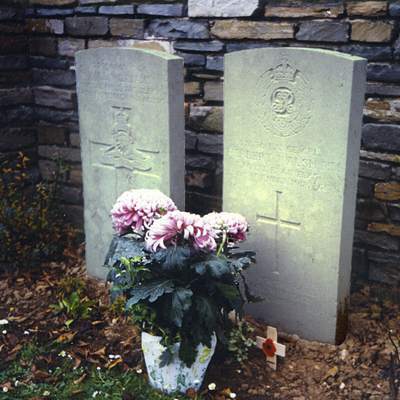 He was 31 years old and had been home for her birth following his third wound of the war since joining up in 1914. He had received this latest one when rescuing one of his officers from the front line. He received the Military Medal for his bravery. He returned to the front when Mollie was six months old. Her mother told her stories about him and that is the only thing that she could pass on as the few photographs she had were lost. I had been in touch with the Forces archives for some time, and they told me that all my grandfather’s records had been destroyed in a fire in the 1920s. However, in 2015, they let me know that some of the damaged documents had been restored and digitised and I was able to get my grandfather’s army records and also sadly a letter from my grandmother to the war office. She had moved home with my mother who was just a year old. This meant that she was finally notified that he was missing in action as the crowds were celebrating the end of the war in the streets all over the country. For weeks she waited for news and had written the letter to try and find out if he was still alive. Only to be told that the death notification had been sent to her old address. She would have been given the location of his grave but as a war widow with a young baby there was no way that she could go to France in those days. The location of his grave in a small village of Poix du Nord in Northern France was only discovered by my sister Diana in the early 1990s and she and her husband took my mother shortly afterwards. We visited again with my mother in 1998 when we were living about 70 kilometres away in Brussels. Standing there 80 years after his death it felt very emotional to imagine that this young man, Herbert James Francis Walsh, had died so young but had still managed to pass on his genes to those of us standing by his graveside, and since then to two more generations. Even though she was so small when you left. And how your sacrifice left her bereft. It was love for both of you at first sight. To stand and fight for your adopted land. As you marched to the docks, kit bag in hand. You never once turned your back on duty. Horror muted by a new born beauty. To parades, loved ones and welcoming arms. As they lay amid the burnt out French farms. Tended by strangers who honour your name. And a young child’s face whose smile is the same. And on and on through generations strong. A child with your blue eyes will read this song. Thank you for visiting today… Sally. Posted on November 10, 2018 by Smorgasbord - Variety is the Spice of Life. War has always inspired writers to communicate their experiences and of those they stand side by side with. From Victorian times through to the Second World War when correspondents from the press and Pathe News provided images as well as words, poetry was the preferred medium. The last poet in this short series is Isaac Rosenberg born in November 1890 to Dovber and his wife, Russian Jewish immigrants who found their way to England. His father was a highly educated and devout man, but to support his family in their new life he had to turn to more hand’s on work. He became a pedlar and he and his wife and family of now six children, moved to London in the late 1800’s so the eldest boy, Isaac could take advantage of a better education within the Jewish community. An accomplished water-colourist, Isaac left school at fourteen and attended an art school in Stepney Green, supported by the Jewish Education Aid Society and private donations. He then moved to Fleet Street as an apprentice engraver until 1911. He then enrolled at the prestigious Slade School of Fine Art where he studied painting and indulged another passion which was writing poetry. Unfortunately, whilst his artwork received good reviews, his poetry appeared to fall on deaf ears. His health at this time also deteriorated as he suffered respiratory problems and fearing he might have contracted TB he took off for South Africa where his sister lived. He spent nearly a year in Cape Town, where he lectured on art and actually managed to have some of his poetry published. He returned to the UK in February 1915 and although very short and slight and under the 5’3” height requirement for the army at the time, he joined a specially formed regiment called the ‘Bantams’. He was posted to the Somme with his regiment and he was to spend the remainder of his life in the trenches. It was here in this dark place that he wrote his best poetry including my chosen piece today – Break of Day in the Trenches. He was killed on 1st of April, 1918 by a German raiding party. He was buried in a mass grave and until 1926 his headstone in the military cemetery guarded an empty grave. His friends arranged for his poems – Collected Works – published in 1922. Hurled through still heavens ? Thank you for dropping in today and of course I would love your feedback.. Tomorrow a poem in remembrance of my own grandfather 1887 – 1918.